When Lakshmi first arose on a lotus from the sea, she was immediately be-decked and be-jeweled by all the gods and sages who prayed she would grant them riches and fulfillment. Feeling a little strapped? Bills getting you down? 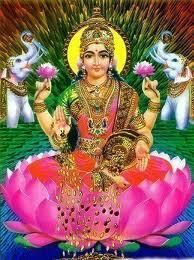 Lakshmi, the Hindu Goddess of wealth, good fortune and prosperity can help. According to the Vedic science of Vastu (Indian Feng Shui) all you need to do is set up a shrine in her honour, light a few candles, intone a few mantras, offer a few treats, and voila, Lakshmi will pour blessings upon you. If this sounds well, a little materialistic – don’t worry. While most of us envision half-starved half-naked Sadhus smeared with ashes as embodying the yogic tradition, Lakshmi assures us asceticism is not the only path. Her two front hands stream with gold coins and material blessings, yet her back hands offer the lotus, symbol of spiritual realization. According to the sacred Hindu text, The Rig Veda, Lakshmi’s name is derived from the Sanskrit word “Laksya”, meaning ‘aim’ or ‘goal’ . Her four arms signify her power to grant the four goals (purushartha) of a successful human life; prosperity and wealth (artha) worldly pleasure (kama) harmonious or righteous living (dharma) and spiritual liberation (moksha). These four purushartha are “for the purpose of the soul” and all four must be achieved to realize a fulfilled life. In other words, our desire for cold hard cash and creature comforts are not sins, they are part of achieving our highest potential. So relax, we don’t need to don loincloths or renounce worldly pleasures to be enlightened – Lakshmi wants us to have our cake and eat it too! Known as Shri, the female energy of the Supreme Being, it is Lakshmi who provides Vishnu with wealth for the maintenance and preservation of creation. Sound too good to be true? Well I have it on the highest authority. According to the Rig Veda the Upanishads and the Puranas, Lakshmi is the goddess in charge of an older less familiar form of yoga, a yoga of attracting wealth and abundance. While many mantras, meditations, and ritual techniques of this yogic tradition remain carefully guarded secrets (lest they fall into the wrong hands) author Linda Johnson has managed to unearth specific instructions from the Padmini Vidya on how you can fatten your wallet. Padmini means ‘lady of the lotus’ which refers to Lakshmi, and Vidya means yogic science. In the practice of Padmini Vidya one works to develop special powers called Nidhis (meaning container of treasure) to attract wealth. Nidhis are accomplished through the active and willful manipulation of Shakti, the feminine energy of consciousness, and directing it to one’s benefit. Similarly, Lakshmi’s sacred text The Lakshmi Tantra also teaches that prosperity is achieved by aligning our consciousness with the energy of the goddess. But this isn’t the kind of ‘prosperity consciousness’ found in The Secret. It involves a lot more than just ‘positive thinking’ – and there are a few caveats. Both the Padmini Vidya and Lakshmi Tantra warn that Shakti is a powerful stream of energy can reshape reality in either positive or negative ways, depending on how you use it. 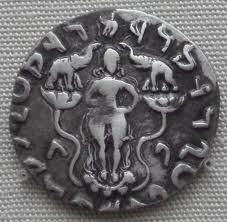 In short, wealth can bestow great power to do well, while misuse of wealth is sure to make a person suffer. Aligning with the consciousness of Lakshmi means understanding that material possessions are not just things to be enjoyed; they are manifestations of a divine energy that must also be honored. And honouring Lakshmi means we must live ethically, respect our family responsibilities and attend to the welfare of our communities. True prosperity cannot be achieved when we have more than our share at the expense of others. But the bottom line is this and Lakshmi’s Tantra spells it out directly. If we wish to never suffer from a lack of resources, “we should respect the living energy of the earth, which is the concrete form of Lakshmi herself.” Those who disregard this wisdom are sure to fall on evil days…. So I ask you, is it any surprise that our modern economies are on the verge of going off the rails? That’s why in this world of debt crisis and environmental debasement, I think we could all take a lesson from Lakshmi. She returns us to an older, more humane view of the world, one in which the earth was sacred and her abundance to be shared by all. Worship of a mother goddess has been a part of Indian tradition since its earliest times. 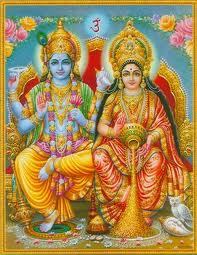 Lakshmi is one of the mother goddesses and is addressed as “mata” (mother) instead of just “devi” (goddess). Lakshmi is the direct descendent of the great mother deities who were worshiped across India, the Middle East and Europe for thousands of years. These ancient goddess worshiping societies were often defined as “Gift giving” economies, meaning all one needed were freely given. It was with the arrival of patriarchal gods approximately two thousand years ago, that the Goddess and her nurturing ways were vanquished. And slowly the material world began to be seen not as holy, but as something that must be transcended in order to access the divine. Today this division between the sacred and the secular continues. And in this modern view of the world it’s okay to become rich no matter what the cost. It doesn’t matter if we pillage a few trees (okay a lot) or blow up a few mountains, or suffuse the earth (not to mention our bodies) with toxic chemicals. But we better beware. According to many sacred texts like the Vedas such disrespect, disorder and bad hygiene, invites Lakshmi’s evil sister, Alakshmi, the bestower of poverty, misfortune and evil winds to set up house. Isn’t this why we could all benefit from setting up a home altar for Lakshmi? As a reminder that if we want to keep the good times rolling in, we better clean up our act? While Lakshmi wants the food on our tables to be abundant and our material possessions to be plentiful, she also wants us to ask – have they honoured the earth? Have we taken without giving back? So this season, engage in a little old fashioned prosperity consciousness, and remember while Lakshmi wants us to rejoice in her bounty, she is also all about the golden rule. And in this spirit, I leave the final word to The Vedas who call Lakshmi Lakshyayidhi Lakshmihi, the one who has the object and aim of uplifting mankind. Next Post I’m No Skinny Minnie Yoga Teacher – But, Oh, How I Want To Be! I love the way you think! And you’re blessed with the ability to express it so eloquently. You’re a gem in a sea of yoga blog regurgitation.